Those were the days... 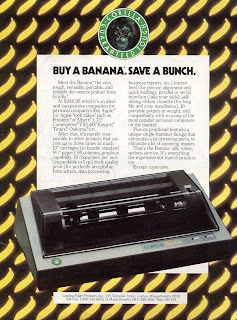 Believe it or not (and some of my students probably didn't when I told them recently), there actually was a dot matrix computer printer called the Gorilla Banana back in the 80s. I never owned one myself but found it in a list of available printer drivers in a Commodore 64 program. Back then I thought it was a joke, but now I've found out it wasn't. Have a look yourselves (Click to enlarge). It was also advertised in 1983 in "SYNC", a magazine for Sinclair/Timex computers. Had one, good rough duty printer. It's only failing was the cast iron frame, Sucker weighed a ton if you hooked it to a Kaypro 4 and had to go mobile. Still have mine down in the dungeon. It's a weird old beast, having only a single "uni-hammer" for pounding out the dots against a ridged revolving bar behind the paper. As one of the previous commenters said: "The good old days..."
Had a Gorilla Banana around 1984 hooked up to an Apple2+ with 128K of memory and a color(!) monitor. The Banana could not print descenders so g j p q y were all raised up to line up with the bottom of the other characters. It was so hard to read that a college professor threatened to fail me if I ever submitted another paper printed with the printer! "Sucker weighed a ton if you hooked it to a Kaypro 4 and had to go mobile." I'm sure the extra 10 pounds to the already 30+ pounds of the Kaypro made the difference. Yup - portable computing, like a boat anchor. I bought one for my VIC-20 in the mid 80's, was cheap and did the job, but let me tell you, it was LOUD when you had the protective cover open. Sounded like a circular saw.. I have one in excellent shape. Interested? One owner, ME. No box but I kept it in great shape. No good ribbons of course. Had one. Two memorable features: loud and slow. The aforementioned uni-hammer was the main reason. Since it had to smack the paper for each pixel it took a while to print even a single letter... And loud! At barely 50 CPS, it took forever to print a document. I ended up starting a print job, and leaving the room while it machine-gunned the paper.